Our dry cleaning department is experienced in processing all levels of garments from a simple blouse to a designer gown. Our experience with problem garments — those with sequins or delicate bead work — has given us a reputation of being an exceptional cleaner. Nothing beats a crisp and clean button-down shirt so we use the highest-rated laundry machinery and finishing equipment in the industry to make sure your shirts look magnificent. Whether those pants are a little too long in the leg to a little too tight in the waist, we can make the necessary nip/tucks to make your garment fit comfortably and correctly. Inopportune wardrobe malfunction? Don't worry because we provide 1 hour cleaning and altering (during cleaning hours) so you can get back to looking your best without having to choose a new outfit. Before that white dress turns a ghastly shade of yellow, let us clean your special gown or suit and seal it up in an acid-free preservation box for safe-keeping. Remove water spots and keep your animal skins looking fresh with an expert cleaning. Our staff is also well-versed in handling one-of-a-kind outfits like professional sports jerseys, concert outfits, military uniforms and broadway and character costumes. Free pickup and delivery of your order is always available. Here is a menu of prices for the most popular items we clean. Give us a call if you have a question about pricing for other articles of clothing. Can't make it to our South Philly storefront? No problem, we can come to you. And do make your way to our part of town sometime to say hi. Our staff would love to meet you. Plus, there's lots of great food around here! and we'll be in touch within 24 hours. If you need a same-day pickup, please call. 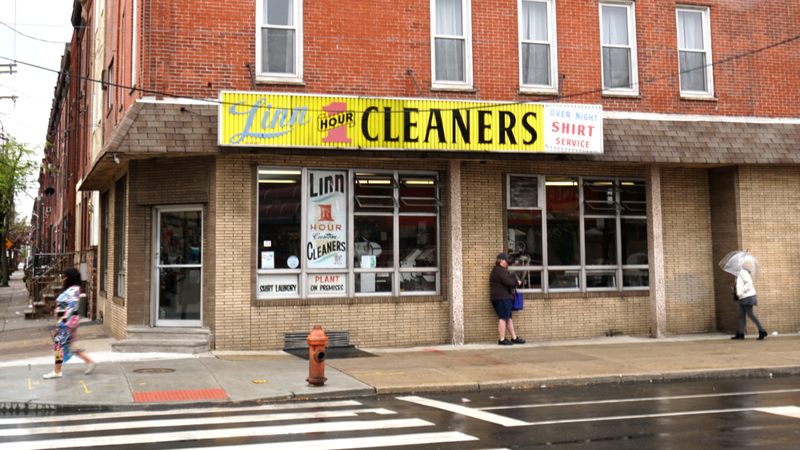 Lattanzio's Linn Cleaners has been serving Philadelphia's dry cleaning needs for seven decades. In 1947, Vince and Marie Lattanzio set up shop in a tiny storefront along Linn Street, in the shadow of the East Passyunk shopping district. Not ones to over-complicate things, they co-opted the store's name from its address. As the business grew so did the need to expand, and in 1953, Vince and Marie built a state-of-the-art dry cleaning plant a few blocks away at 15th Street and Synder Avenue — the store's present day home. The business is now run by the couple's sons, Joey and Vinnie, who you'll find serving customers from behind the counter, picking up or delivering clothes or pressing garments in the plant. We're honored to clean the Philadelphia Eagles' jerseys – keeping the team looking fresh on the field each week. The Philadelphia Inquirer profiled our work on the Eagles' gear for a special series "We the People." Check it out here.